When I first started writing my Finding Fashion blog posts, I always had the intention of finding a full outfit that includes shoes, accessories and jewelry (for $100 or under), using only the stores Walmart, Kmart, Target and Payless Shoes. I had originally created these shopping “confinements” because we had been living in a very rural area and the aforementioned shops were the only options near us (that has recently changed, and we are city-kids again). I chose using the budget constraint of $100 or less for a full ensemble because it is a pretty accurate estimate for my own personal day to day wardrobe costs, and I truly feel that you don’t have to spend a lot to look great. Onto why we are really here! Finding Fashion! 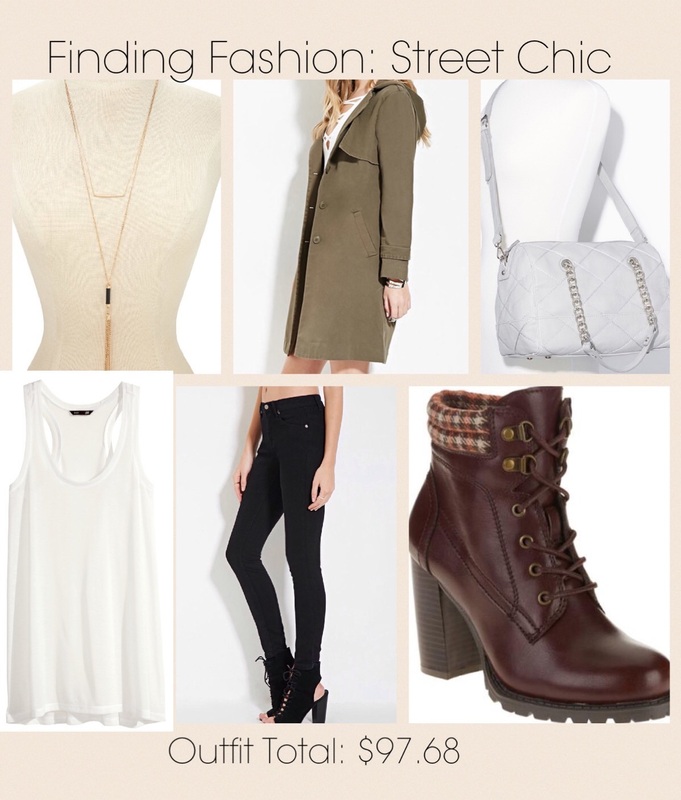 I love the idea of “Street Chic”. For me it encompasses great fashion that is not found stomping down an exclusive runway; but rather it is seen traipsing down the street for everyone to see and adore. It’s lived in, beautiful, inspiring, fashion forward clothing that is attainable to the average fashionista! That’s why I picked this particular (P)inspiration outfit from my Pinterest board. Enjoy! Are you loving what you see here? Want to shop this look? Here is where I found it!